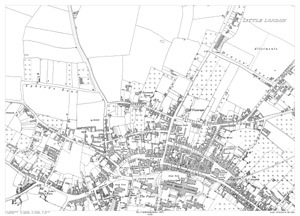 Showing the area from Little London in the north to Holy Trinity Cathedral in the south, and from Mills Lane in the west to Brays Lane in the east. 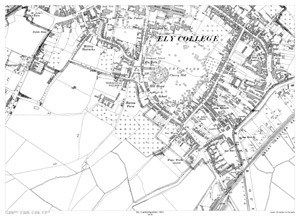 Showing the area from The Palace in the north to the Railway Station in the south, and from Smockmill Alley in the west to beyond The Quay in the east. 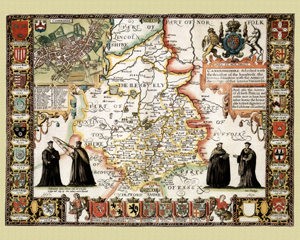 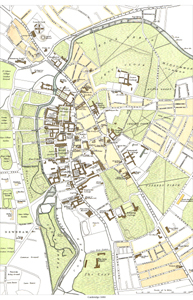 A modern print showing in detail the area from County Gaol in the north, to Bateman Street in the south, and from Ridley Hall in the west to Gonville Place in the east.